TUCSON – The spotlight was on collegiate swimming in the United States last week, but high school and professional swimmers got some attention as well as March’s swimming championships gave us plenty to discuss. 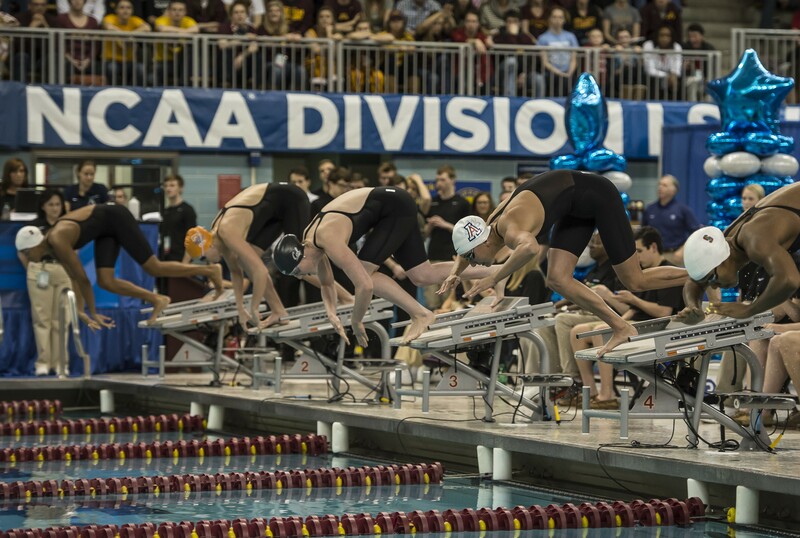 We’re counting down the top five swimming headlines of the past few days for The Week That Was, starting with the first national collegiate championships of the season. After a one-day delay due to the inclement weather about to hit Oklahoma City, the NAIA championships began with a mad rush of record-setting performances. Christine Tixier of Biola was one of the stars of the meet, breaking a 22-year-old division record in the 200 IM with a 2:02.75 as one of three to also break the record. 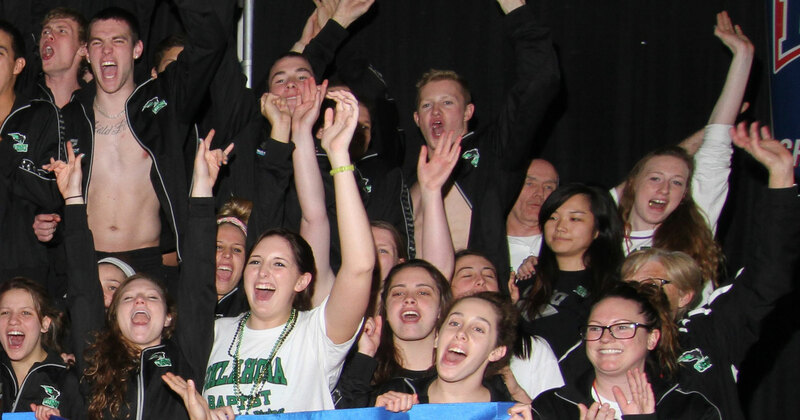 Oklahoma Baptist was crowned the men’s and women’s team champions once again by wide margins, an impressive feat for a program that is only four years old. At the national junior college championships, Indian River continued its reign with the men winning team title number 41 and the women taking their 33rd trophy. Only two events at the meet were not won by Indian River, and Tamara Miler of Monroe was the victor in both, taking the women’s 500 and 1650 freestyles. Stefan Stojmenovic of Indian River, who will be swimming for Florida State next fall, was impressive throughout the meet, including a 46.99 in the 100 butterfly. The battle for the women’s NCAA Division I swimming and diving team title looks to belong to the California Golden Bears, based on the seeds in the psych sheets. But championship meets always produce a few surprises to upend predictions, and the Georgia Bulldogs will fight hard to defend the title they have won the past two years. Missy Franklin will be swimming a couple of different events in her final NCAA meet, racing in the 200 IM and 200 back instead of the 100 and 500 freestyles. Look for a few NCAA and American records to fall at what is bound to be another exciting meet. Andrew Seliskar made college swimmers very nervous last weekend when he raced at the Potomac Valley short course championships. The high school senior, set to be a California Golden Bear in the fall, made his way into the top 10 all time in the 400 IM and 200 breast with national age group records. His 3:37.52 in the 400 IM puts him fourth behind Chase Kalisz, Tyler Clary and Michael Phelps in the history of the event and took down Kalisz’s 17-18 national age group record. In the 200 breast, Seliskar’s 1:51.57 makes him the fifth-fastest performer in history and drops his lifetime best by seven tenths of a second for another national age group mark. If Seliskar were a collegiate swimmer, he would be ranked number one at this point of the season, though times are bound to supplant that at the NCAA championships. For good measure, Seliskar also put up a 52.05 in the 100 breast, 4:16.17 in the 500 free, and 1:42.84 in the 200 IM. 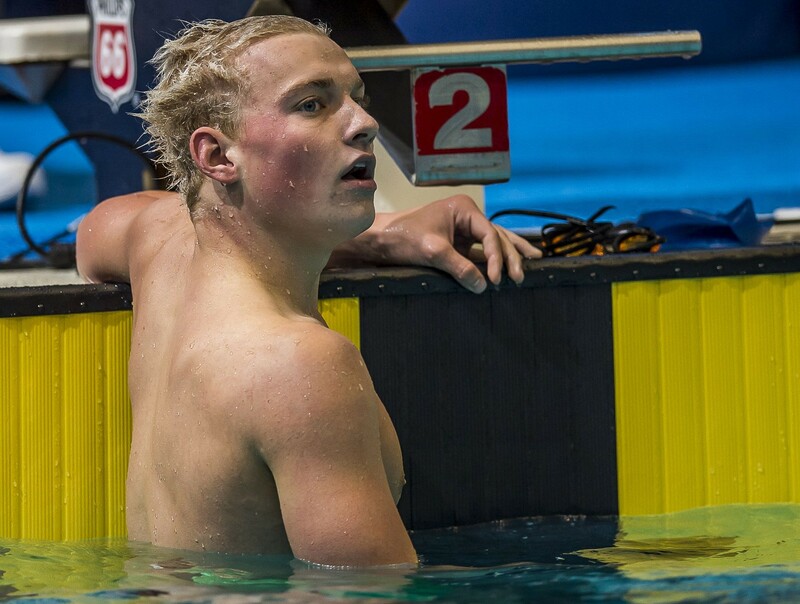 Seliskar said in a video interview that he’s looking to go faster next week at the NCSA junior national championship in Florida, a meet that will be streamed live by SwimmingWorld.TV. 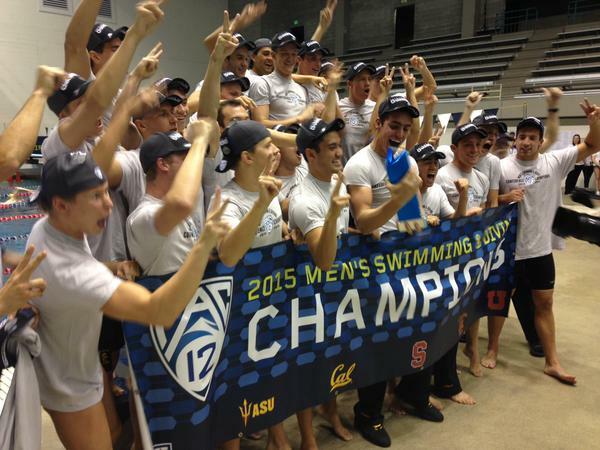 The men’s Pac 12 championships was a nailbiter for fans of Stanford and Southern California, as the two schools battled tough for the championship trophy. Stanford looked to have the advantage through the first three days of the meet, but Southern Cal made some moves on the final day with strong efforts in the 100 free and 200 breast. By just nine points, the men of Troy beat Stanford and returned the title to Los Angeles after last winning in 1979. The meet was highlighted on Thursday by an American record by David Nolan in the 200 IM with a 1:40.07. Nolan beat Ryan Lochte’s record from 2007 by just one hundredth of a second, and now all eyes will be on him at the NCAA championships for a possible historic dip under 1:40. Cristian Quintero was a big factor in USC’s team title, winning the 100, 200 and 500 freestyles and swimming on three winning relays. No one at the Pac 12 championships has ever won those three freestyle events in one year, which only shows how unique Quintero’s talents are. Will that carry over to three wins at the NCAAs? Michael Phelps was the subject of a lot of headlines this past week. First, he was part of the speculation that he might be reinstated to the world championship roster based on comments from USA Swimming Executive Director Chuck Wielgus that some discussions have been made, though nothing is official. If that happens, Phelps might swim all three of the individual events in which he originally qualified, or just a few. But it’s still very early in the process, and no one is saying how much of a chance Phelps has to get back on the team after withdrawing in the wake of his DUI arrest. Last weekend, Phelps was part of the North Baltimore Aquatic Club contingent at the American Short Course championships, where he swam some lifetime bests in the 200 IM and 100 fly, and almost got a personal best in the 100 free. His 200 IM time of 1:40.84 is his first time under 1:41, his 100 fly time of 44.91 puts him 10th all time and his 42.17 in the 100 free is his second-fastest time ever. These times will not be officially entered into the lists of top times in history, as Phelps is still serving his six-month competition suspension for that DUI arrest. Phelps swam those three events as exhibition swims, not in official sanctioned time trials, so on the surface, he did not violate his suspension. 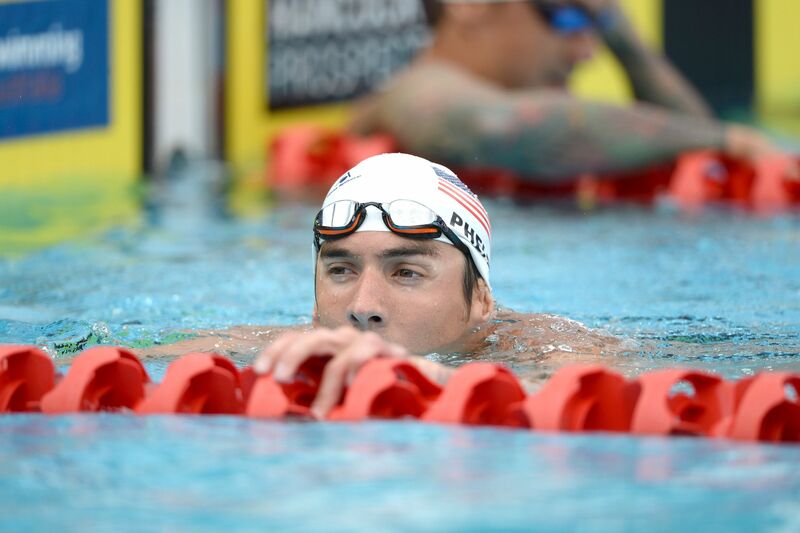 But the times show that Phelps’s troubles recently haven’t slowed him down, and we’ll see how that translates when he races officially next month in Mesa, Ariz., at the Arena Pro Swim Series.